Rig up two downrigger clips to add some depth to your spread. Rig up two downrigger clips to add some depth to your spread..
Downriggers will bring your baits down to the desired depth to get a bite. However, it's a good idea to swap out the stainless-steel cable for mono or braided line to get rid of the hum and vibration the cable causes. You can also increase your success by using dual downrigger clips. Photos by Steve Dougherty. There are several ways to stack the release clips, but the easiest is with twin pad release clips and a Coastlock Snap dropper setup. 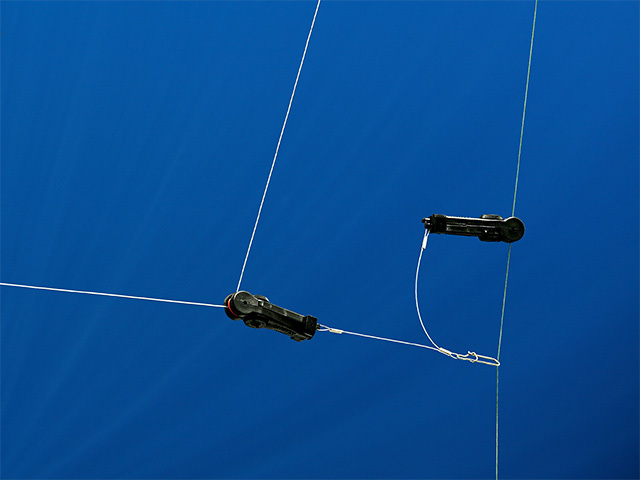 Using your sounder to mark fish and the downrigger to cover a large portion of the water column is the key to success, just remember that the prevailing conditions and target species may require adjustments in your rigging techniques. When you're marking fish down in the water column, you need to find a way to get to them. 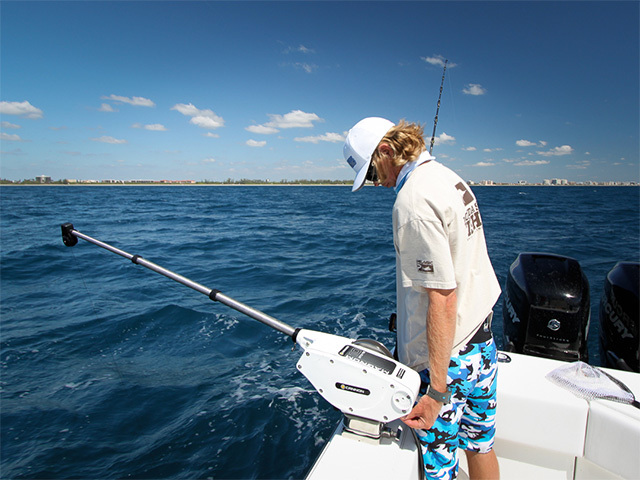 Innovative anglers have developed several techniques to present their offerings below the surface, including planers and inline trolling weights or drails. However, these tools come with a bit of guesswork regarding the precise depth of deployment. Downriggers are much more accurate for deep-water presentations and also provide the opportunity to fish with light tackle. Though presenting a single offering from a downrigger is highly effective, the most successful anglers add depth to their spread by stacking the release clips. When dual downrigger clips are used in conjunction with the depths of the marks on your sonar, you can present more than one bait throughout the water column with incredible precision. Most downriggers are pre-spooled with stainless-steel cable. When pulled through the water the steel cable creates an audible hum and vibration that the fish find a bit offensive. 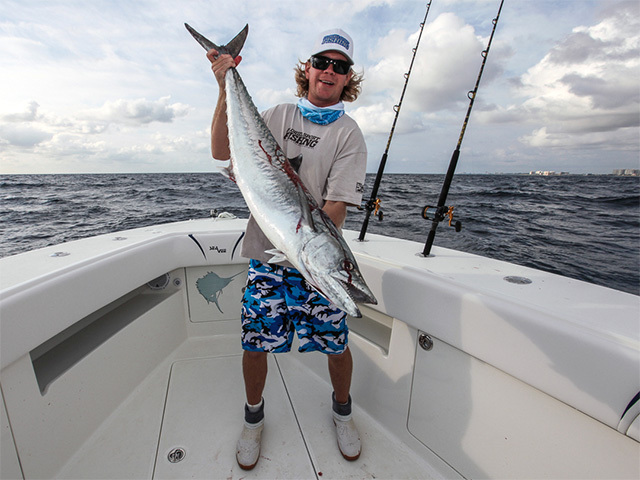 Because of this unwanted attribute, many choose to remove the stainless cable and spool up the downrigger with 150-pound test braided line or monofilament. While monofilament is much more user friendly, it does increase blowback, the angle of line scoped out to your bait. It’s impossible to eliminate blow back entirely, but it can be minimized by using thin-diameter braid. Like outrigger clips, there are several types and styles of downrigger release clips on the market, but they all serve the same purpose, to release the fishing line from the downrigger when a fish strikes. Most anglers prefer to fish a traditional style release clip attached to the rigger line slightly higher than the downrigger ball with a pad release clip used higher up the downrigger main line. Regardless of the method you favor, when stacking clips start by sending out your first offering 50-feet behind the boat. This will be the deepest bait. Once the bait is rigged to the first clip, lower the downrigger ball to about half the depth you plan on targeting. Place your second clip on the line at this point and deploy your second bait 40-feet back. Pinch open the release clip and place the second line in the stacker clip and lower the downrigger ball to the desired depth. Remember to keep both outfits in free-spool while deploying. There are numerous ways to rig a downrigger, but the bottom line is that this essential tool is crucial to capitalizing on a deep bite for kingfish, wahoo and more. Covering a large portion of the water column is the key to success, just remember that the prevailing conditions, species in your crosshairs and target depth may require adjustments in your rigging techniques.